I must tell you that Elizabeth Lawrence's study contains some rather large rabbit holes. A few evenings ago, I fell into one and came up with a brand new word -- pleasaunce. Let me start at the beginning. When I came home from my vacation and looked at my photos of Elizabeth Lawrence's study, I didn't feel I had done it justice, or that I had asked enough questions. 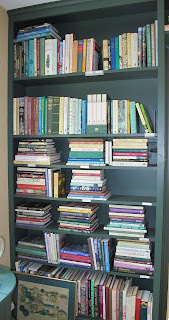 For example, the wall containing the door into the study is lined with built in bookshelves. I took pictures of one side of the door and the other side of the door but not of the door between the two sets of bookshelves. Remind when I visit again, and oh, yes, I shall visit again, I will arrive promptly when the garden opens and I will not leave until the garden closes. I will not be in a big rush with a long drive ahead of me to get to another destination. Anyway, those are not Elizabeth Lawrence's library of books on the shelves of her study. Those are books donated by Allen Lacy. So where are Lawrence's books? 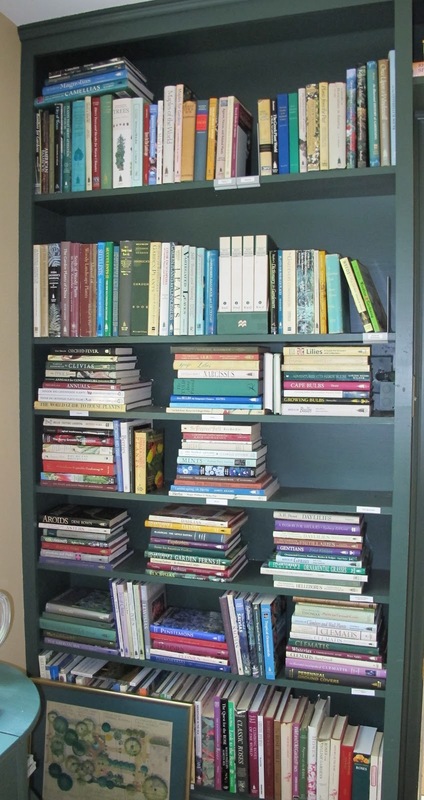 Her library of books, all 513 of them, are safe and secure in the Cherokee Garden Library at the Atlanta Historical Society. I found that out by reading an article on the Wing Haven website about two volunteers at the library who were given the opportunity to go through all of Lawrence's books to catalog the ephemera within the pages. Ephemera are paper items that are usually insignificant and often discarded, but if kept long enough and associated with someone like Elizabeth Lawrence, they become something of significance. If you read the article (please do!) you'll find that Lawrence tucked all kinds of things between the pages of her books - a review she wrote about the book, or a receipt for the purchase of the book, or correspondence with the author, or even a grocery list or two. Reading through the article, you'll find that the two volunteers often went out to the Internet to look up more information on something they found in a book, or because of the book itself. Which leads me, like the two volunteers, wondering what a "pleasaunce" is. It seems that Elizabeth Lawrence owned a book called "The Peacock's Pleasaunce" by E. V. B. (Eleanor Vere Boyle). Now, Eleanor could lead us down yet another rabbit hole, but let's focus on "pleasaunce". A pleasaunce, as it turns out, is an obsolete word that means, "a region of a garden with the sole purpose of giving pleasure to the senses, but not offering fruit or sustenance". Today, we might use the word "pleasance" in its place. Or stick to the old pleasaunce. Did you know that two thirds of my backyard, including Plopper's Field, is a pleasaunce? The other one third is the vegetable garden. Now, if you'll excuse me, I must go out and tend to the pleasaunce, which in this drought does not give me much pleasure. But if I pull the weeds and deadhead the flowers, perhaps it will become the pleasaunce I hope it to be. And I hope you find pleasure in your pleasuance, or pleasance if you prefer, this weekend. Just watch out for rabbit holes. I love Elizabeth as well. I just had to read that article. I really enjoyed it. Thank you for sharing your adventure to her garden. Hi Carol, Because I read blogs, I now know that I have both a pleasaunce and a potager. I have really enjoyed your series on the gardens of Elizabeth Lawrence. How amazing that she wrote 513 books! Thanks for sharing these past few very informational and fun posts. Beth, just to clarify, the 513 books were in her personal library... She didn't write all of them. Another new wonderful word!! And it describes my fern border...it is only there to bring peace, a cool green ness feeling...my place to go read and dream....my pleasuance. I may just have to work that word into a name for the fern border. heehee. The only things getting much pleasure out of my pleasaunce today are the 9 million aphids that have descended on every leaf, but I'll hope to need that word some day! Your link to the collection was a minor rabbithole, Carol - sent me bouncing from one article to another. I am so glad you got to go to both the Clarkson's Wing Haven and Elizabeth Lawrence's garden. But I noticed something funny while bouncing around (had to look up undulant fever, among other things)... while we own books by Elizabeth Lawrence & Allen Lacy and I think of them as famous, neither of them has a page on Wikipedia. That does not seem right! I have about 98% pleasaunce in my garden. A nice way to think of it...as a pleasaunce. Pleasaunce, that;'s most of my garden. I like the word!